I coach athletes all over the world who range from beginners to seasoned vets. This group of runners is collectively known as Team Wicked Bonkproof, and we've built a community together that is supportive, constructive, and conducive to better running. As a coach, my job is to help each runner get the most out of their body, and enjoy the process of training and racing. Whether you are looking to run a 5k for the first time, or striving toward the Olympic Trials, I'd love to hear from you. Back in 2006, I was at the point where I couldn't run at all without pain. A knee injury that I sustained while playing basketball in college had been getting worse over time, and I knew I needed a reset. I ended up scheduled for an ACL reconstruction surgery, which took place in February 2007. About 6 months later, I was done with a long rehab process and cleared to train again. In 2008, I ran my 2nd marathon and missed my goal of qualifying for the Boston Marathon. I was frustrated with the repetitive and formulaic training options available at the time, so I decided to start writing my own training plans based on what I had learned through experience and studying some of the best contemporary coaches. My next marathon was a huge success. 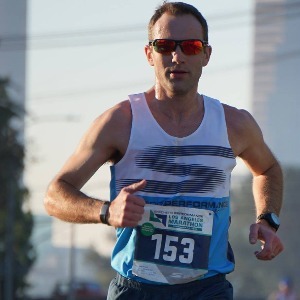 I PRed by 20 minutes, earned a BQ, and I was well on my way to honing the "bonkproof" training methodology that has become a hallmark of my coaching style. Since then, I've continued to coach myself and I've lowered my PR to 2:30:39 for the marathon, 1:10:57 for the half marathon, and 15:43 for the 5k. I've continued to tweak the approach over time, using myself as the primary test subject. Somewhere along the line, I started writing training plans for family and friends. Over time, the demand for advice and training plans continued to grow. So, I got some additional training via USATF, and transformed my hobby into a career. In 2013, I left my job in technology consulting so I could put all my energy into coaching and running. Success. Coach Caleb Masland has been notified of your message.